This archive holds all posts form January 5, 2009. This is the week that a lot of people are returning to school after the break, or at least thinking about the return to classes. And, many people, like Pitseleh at Backstage, are planning of courses for the coming semester. So, I thought it might be a good time to address the ways you can use Racism Review in the classroom. 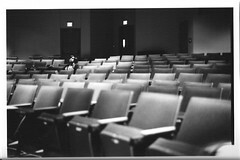 Part of the reason Joe and I started this blog was to provide resources for those who typically stand in front of the classroom, as well as provide an ongoing place for discussion for all of us who sit in those rows and rows of chairs ( photo credit: brandongreer – with apologies to all you Freirians who are putting your chairs in a circle, the ones at my institution are bolted to the floor like the ones in this image). We’ve added a pages here with a few syllabi from other instructors (feel free to send me others and I’ll add them to the collection). We’ve also got a good list of topic-relevant documentaries from a variety of filmmakers that you may find useful in designing your courses. Or, if you’re taking a course, these will point you in the direction of books and films that could help you learn more. In addition to these rather unidirectional resources, the interactive quality of the blog can be useful for learning about race and racism. Assign it as supplemental reading requirement. This is good choice if you have a few students who are very interested in the topic and want explorations beyond the classroom. As with any supplmental reading, this is difficult (if not impossible) to evaluate, so I don’t usually include this in the grading scheme. Make it a required reading assignment. As a required reading assignment, you can then have students write a reaction paper to what they read in a post (either whatever’s currently on top of the blog, or you as the instructor can pre-select one and assign it). You can also have students read the blog and come to class prepared to discuss what they’ve read (my experience is that the discussion is more lively if they’ve written about it first, but your mileage may vary, as they say). Again, the reading is difficult to evaluate on its own, so the grading scheme here would be to evaluate the reaction papers or the classroom discussion. Offer students the option of extra credit points for comments. This is what I’ve done most often, and it seems to work well with undergraduates who are highly motivated by extra credit points. Typically, what I offer is one point of extra credit (added to the cumulate course average) with a maximum of five to ten points, depending on the class. I require the students to print out all the comments they made and hand them in on the last day of class. Volunteer to Guest-Blog about a topic that you’re covering in the class and have students comment. It’s often the case that we have so much more that we want to share with our students than the boundedness of the physical classroom will allow, and the blog is a good way to push beyond those walls. I found this especially useful when I was teaching a class about Hurricane Katrina and there was just so much more I wanted to share with the class than I could in the allotted time. So I addressed those issues in the form of blog posts, and then assigned them as required reading. If you’re teaching about race/ethnicity and find that there’s a particular topic you’d like to explore in more depth, consider being a Guest-Blogger for Racism Review and writing a post on the topic. (Email me for details if you’re interested: jessiedanielsnyc _at_ gmail _dot_ com). Create writing assignments for students that follow a blog post format. This is a more advanced sort of assignment and I’ve done this with upper-division undergraduates and graduate students. Depending on what your other pedagogical goals are in the course, you might want to think about including writing assignments that require students to write in the form of a blog post. If they’re good, and they’re about racism, we’d be happy to include them here as guest-bloggers. The format we usually follow is fairly simple: 500-1,500 words on a current news item related to race/racism with some analysis that includes relevant social science research. The tone is professional, but relaxed. In one graduate course I taught, the blog writing was 30% of the overall grade and I evaluated it based on both form and content. This can be an excellent assignment for more highly skilled students, and especially students who are familiar with blogs and used to the format. The possibility of getting their post on a well-read blog can be a real incentive for hard work in the classroom. Something fabulous you design. Of course, I’m sure there are lots of other ways you could have (or already have) used this blog in your classes. Let us know what you’re doing and how you’ve used the blog in the classroom.